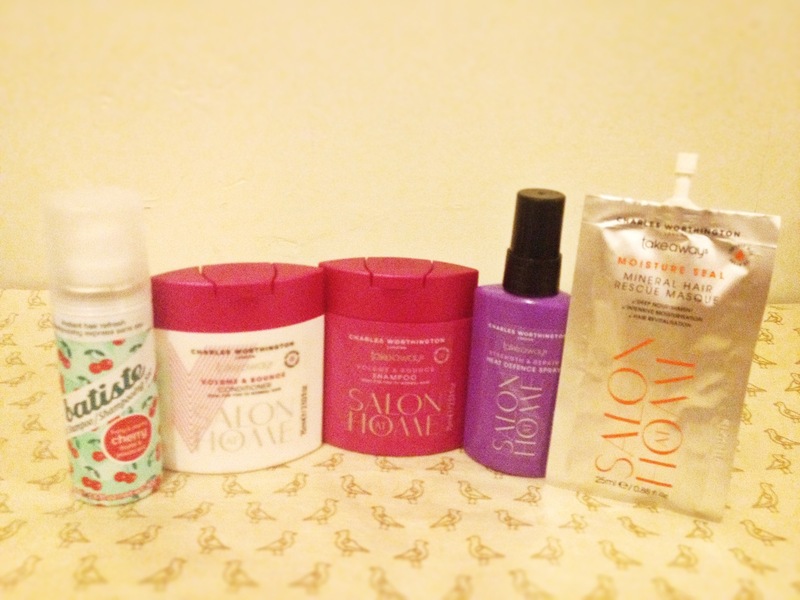 ← My holiday hair essentials…. If you’ve read my post from last year ‘My Holiday Hair Sins : Confession & Redemption’, you will be aware of how much damage I did to my hair on our 10 day trip to Ireland, through lack of organisation (didn’t pack any toiletries!) and a bit of a careless attitude towards my hair. I mean really, how much damage can you actually do in just a week? Well, sadly, the answer is a lot. 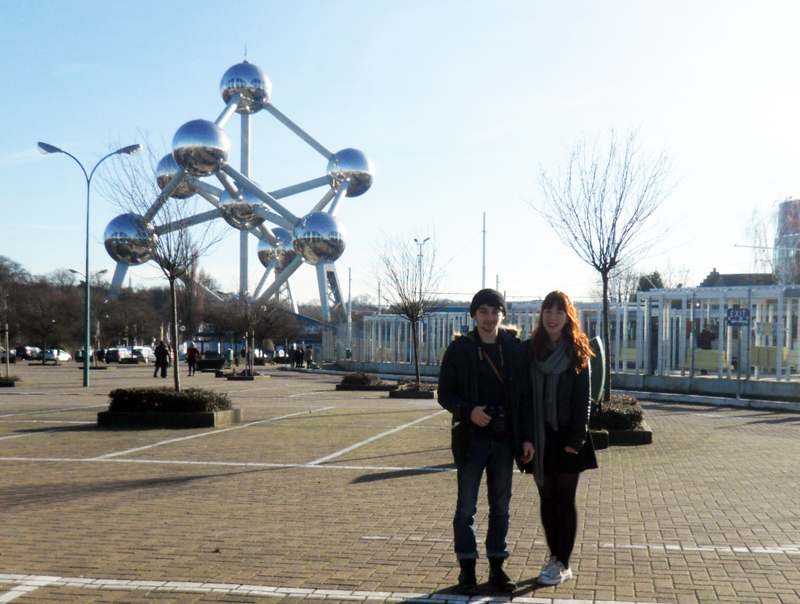 Me and Dec at the Atomium, Brussels. So to prove I had learnt my lesson, I made sure to go out an do a little holiday hair haul in Boots. I knew the weather would be freezing in Belgium, and that we would come home to a very warm centrally heated apartment; a combination that always leads to parched and frizzy hair. As my hair is fine, and I want it to look its best on holiday I opted for a volumising shampoo & conditioner to give it a bit of bounce, and to try and counteract the hat hair look I would undoubtedly experience. To hydrate my hair I chose the Charles Worthington mineral mask which I would use halfway through the holiday, and most importantly of all, a ‘Strength & Repair’ heat defence spray. I normally avoid any kind of heat on my hair, but if there is one time you are going to let yourself commit a small hair sin, it might as well be on holiday, just make sure to protect it! I’ve always been a big fan of the Charles Worthington range, in terms of mid-range hair care brands like Umberto Giannini and Trevor Sorbie, this is definitely the best. The first thing I love is the packaging, it’s so simple and effective, each colour targets a specific hair so it’s easy to find what your looking for and the bottles have a sophisticated unique shape that I like to keep on my dresser. The ‘Volume & Bounce’ range is packed full of collagen, which penetrates the hair strand and pumps it up, like a plumping lipgloss (or botox!!!). I’m always a bit worries when using volumising shampoo’s and conditioners that they will dry out my hair and I’ll end up with kind of swishy split ends than a voluminous moisturised mane. I was very pleasantly surprised by how soft my hair felt when I was beginning to dry it. The conditioner was really rich and creamy, but somehow it had left my hair feeling super lightweight and swishy! I hadn’t bothered to buy any styling products, but I didn’t miss them as my hair definitely felt thicker and bouncier with just the shampoo & conditioner. The effects didn’t last all do, and the winds and rain did manage to batter my roots down to their lifeless selves, but I would highly recommend these products if your getting ready for a night out or date, I will definitley be buying the full sized versions next time I’m in town. I’m planning on doing a battle of the volumising shampoo’s & conditioner’s post in the next few weeks as I have tried out so many, some much better than others, keep your eyes peeled! I like to consider myself a bit of a hair masque connoisseur, I must have bought dozens of different ones over the last few years. It’s hard to find any that really ‘Wow’ me, I’m a big fan of Kerastase Nutri-Thermique and Redken’s Extreme strength builder, but they are very pricey. I felt like this Charles Worthington one was okay, it definitely made my hair a bit softer than when I was using the normal conditioner, but it didn’t give that veil like feeling you get with premium products, I also wasn’t overly keen on the scent. I don’t think I can really give this a fair review as a sachet only contains a single wash’s worth, but I doubt I will be buying the full size version. I’d always recommend either making your own with coconut oils and eggs, or splashing the cash and buying a really good quality deep conditioner. I’ve been using this product for a couple of years now, it’s my go-to heat defence spray and I just cannot fault it. I have the full size bottle which I keep at uni, and two travel sized ones that I keep at Dec’s and my Mum’s because I just can’t be without it. This is the only heat defence spray that I find leaves no residue or build up on my hair, and it leaves is feeling really soft once I’ve styled it. It also works fine on dry hair, whereas others can leave it feeling sticky. It smells great too! For the price, I really can’t rate it enough! Hopefully this year me and Dec will be going on a nice sunny summer holiday, hot weather will require a completely different approach and another holiday hair care haul! What are your travel essentials for when your away? I’d love some recommendations! Posted in Hair care and tagged Beauty, charles worthington, hair, hair tips, haircare, holiday, product, review, shampoo. Bookmark the permalink.